Here, in a wide-ranging interview from German expo gamescom, Eurogamer runs through the long list of games with a fine-tooth comb, turning up update after update. Read on for the results. Eurogamer: What about Crysis 2? 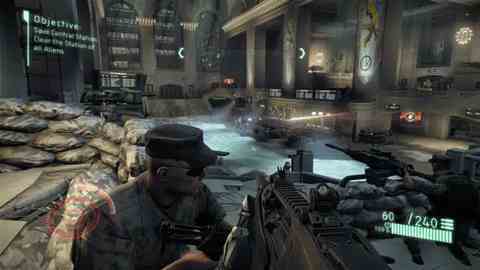 Did Crytek ask for more time, or was the delay about avoiding the busy Christmas period? David DeMartini: A game like Crysis and a team like Crytek's never going to be intimidated by being in any window. But they will always be very careful of not releasing a game until it reaches its full potential. As we collaboratively evaluated when's the right time for it to be ready, 22nd March was the perfect window for the game to hit its maximum potential. It's going to be another 90-rated game from Crytek. It's going to be on multiplatform for the first time. They just showed a glimpse of the multiplayer. There's a lot of information that will be forthcoming with regards to the depth of the number of multiplayer modes, maps. I can say there's an entire team [Crytek UK] working on multiplayer alone for that game in England, so you can imagine how strong the multiplayer mode will be. Eurogamer: You have a long-standing relationship with Valve. What's happening with Portal 2? Will you publish it? David DeMartini: We're still talking about it. The interesting thing with Valve is they always make great games. They ship them exactly when they're going to ship them. They're a high-quality partner, and they demand excellence from anybody they have a relationship with. You earn their business every single time. We're in the process of earning their business yet again for Portal 2, and we're very optimistic because of our close relationship. We do a lot of business on Steam. They do a lot of business with us on the distribution side. The biggest mistake studios make is they get too big too quickly. A one-team studio that has a great IP quickly wants to get a second team started, a third team started. And many times they want to do things in different genres, which is incredibly difficult. With Valve and Insomniac, they're able to play in different genres with multiple team studios, and still execute to the same level of excellence across genres, across teams. That's when you know somebody has truly arrived, is when they can have multiple teams working on multiple IPs, all delivering a 90-rated quality. That's a studio that really knows what they're doing.